The Duncan Hines Holiday Velvet cake mix is so much fun to bake with! 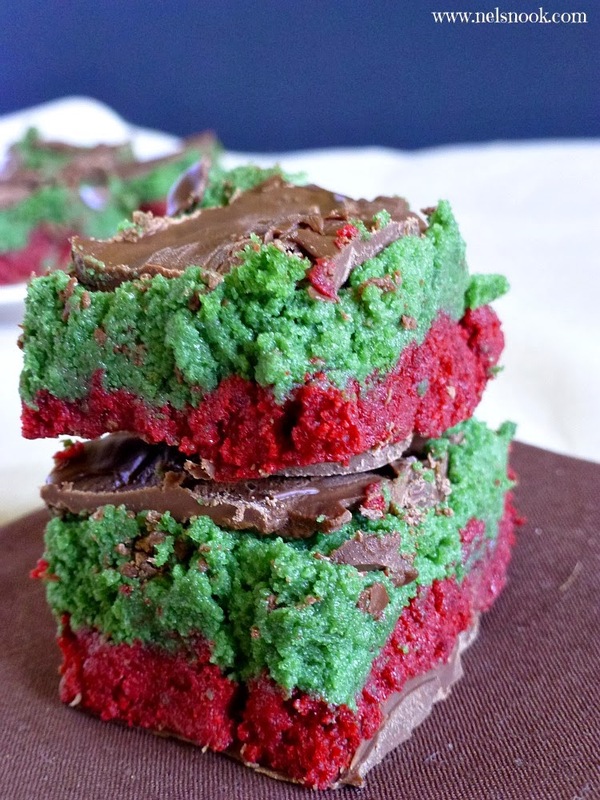 The box comes with a bag of both red and green velvet cake mixes. I wanted to do something extra special for this extra special cake mix. One of my family's favorite holiday treats are cake pops or cake balls. This holiday season I have been crazy busy and just didn't have time to sit and dip cake balls. So I tried something new - I made cake pop bars. These bars have the same great taste as cake pops without all of the work! These cake pop bars turned out awesome - everyone loved the bright colors and they tasted just like cake pops! The only challenge was cutting into the chocolate layer without it cracking. Using a warm knife helps - I just dipped a knife in warm water and then wiped it dry. 1 package (24 oz) of Chocolate Almond Bark or your favorite chocolate coating for cake pops - you will use about 3/4 of it. Preheat oven to 325°F. Grease sides and bottom of each pan with shortening or oil spray. Set aside. Blend green velvet cake mix, 1/2 cup water, 1/4 cup oil and 2 eggs into a large bowl at low speed until moistened (about 30 seconds). Scrape sides of bowl. Beat at medium speed for 2 minutes. Pour batter into first pan. Set aside. Repeat above mixing instructions for red velvet cake mix. Pour batter into second pan. Bake both 8" cakes immediately for 29-34 minutes. Cakes are done when toothpicks inserted in center comes out clean of crumbs. Cool cakes completely. Once the cakes are completely cooled, break each colored cake into its own large mixing bowl until the cake is small crumbs. Divide the frosting equally between the two bowls of cake crumbs. Mix the frosting and cake crumbs together until well incorporated. Set aside. Line a 13x9 pan with parchment paper and set aside. Melt about 3/4 of the bar of the almond bark according to the package. Pour half of the melted chocolate in the 13x9 pan and spread it over the bottom on of the pan evenly. Let harden. Once the chocolate is hardened, press the red velvet cake pop mix evenly over the chocolate. Gently press the green velvet cake pop mix over the red velvet cake pop mix. 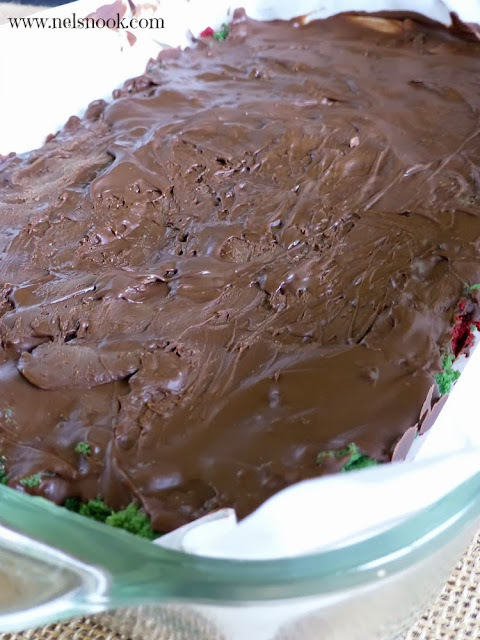 Pour the rest of the melted chocolate over the green velvet cake mix and spread evenly. Let the top chocolate layer cool completely. Cut with a warm sharp knife to serve. Do you like cake pops? What's your favorite flavor?? 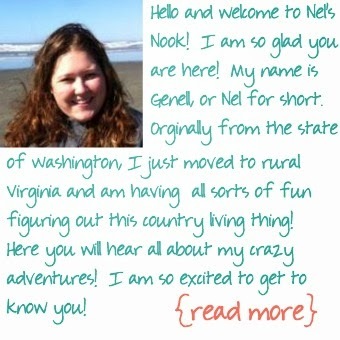 Yea with being out of town for the holidays I got off track with blogging but I am excited to start up again. I look forward to getting to know you too. Stopping by from the SITS Tribe and Your Christmas recipe looks yummy! 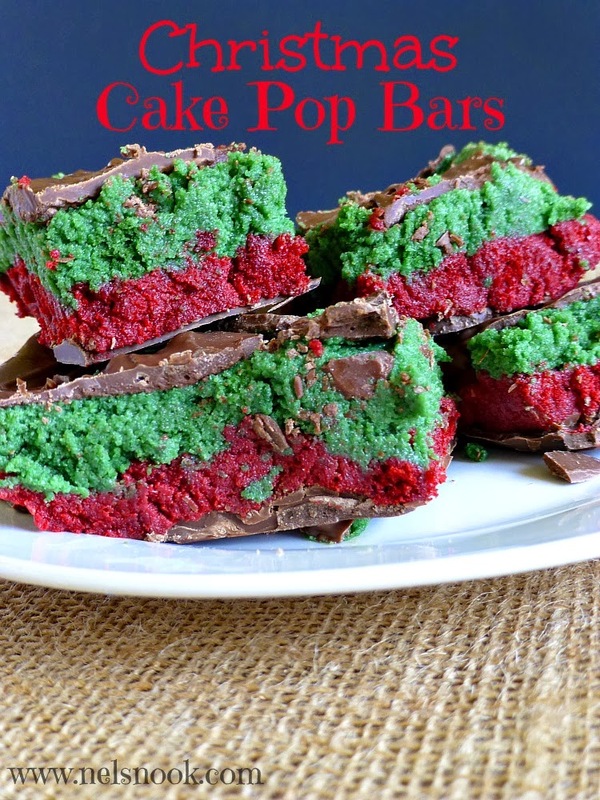 Cake pop bars!? Serious genius. Thank you Erin! They taste just like cake pops without all of the work!